This is the device compared to a US dollar coin. 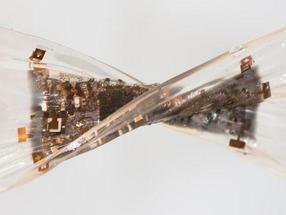 This '3-D stretchable electronic' device can stretch, bend and twist without compromising electronic function. 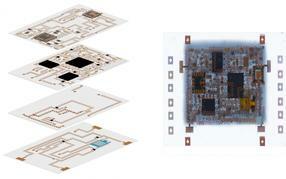 These are four layers of stretchable circuits (left) are combined to create the full device (right). "Our vision is to make 3D stretchable electronics that are as multifunctional and high-performing as today's rigid electronics," said senior author Sheng Xu, a professor in the Department of NanoEngineering and the Center for Wearable Sensors, both at the UC San Diego Jacobs School of Engineering. Xu was named among MIT Technology Review's 35 Innovators Under 35 list in 2018 for his work in this area. To take stretchable electronics to the next level, Xu and his colleagues are building upwards rather than outwards. "Rigid electronics can offer a lot of functionality on a small footprint--they can easily be manufactured with as many as 50 layers of circuits that are all intricately connected, with a lot of chips and components packed densely inside. Our goal is to achieve that with stretchable electronics," said Xu. And the researchers did not sacrifice quality for quantity. "This device is like a 'master of all trades.' 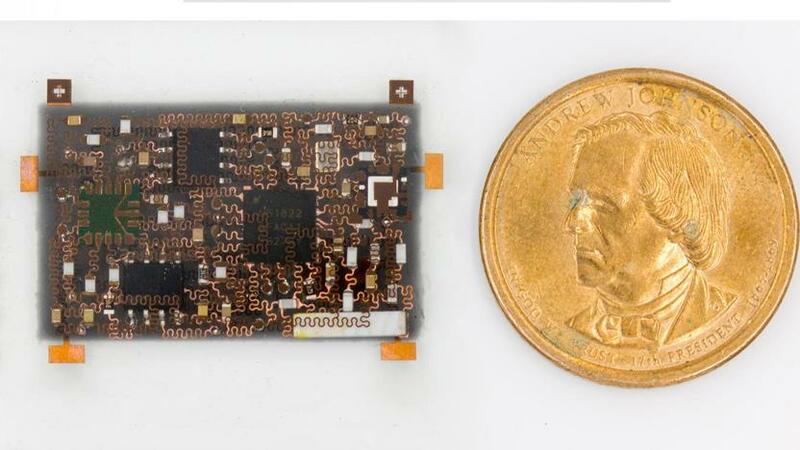 We picked high quality, robust subcomponents--the best strain sensor we could find on the market, the most sensitive accelerometer, the most reliable ECG sensor, high quality Bluetooth, etc.--and developed a clever way to integrate all these into one stretchable device," added co-first author Yang Li, a nanoengineering graduate student at UC San Diego in Xu's research group.